She was born in 1647 AD at Janots, a small town of Burgundy, the fifth of seven children, of Claude and Philiberte Alacoque. Her father was a prosperous notary; the family owned a country house and farmland, and had some aristocratic connections. Margaret’s godmother was a neighbor, the Countess of Corcheval. As a small child Margaret spent a great deal of time with her, but these visits were brought to a sudden end by the death of the countess. The father died of pneumonia when Margaret was about eight, and this was another severe shock to her. Claude had loved his family dearly, but had been short-sighted and extravagant and his death put them in hard straits. However, Margaret was sent to school with the Urbanist Sisters at Charolles. She loved the peace and order of the convent life, and the nuns were so impressed by her devotion that she was allowed to make her First Communion at the age of nine (normally around the age of 12). A rheumatic affliction kept her bedridden for four years. During that time she was brought home, where some of her father’s relatives had moved in and taken over the direction of the farm and household. She and her mother were treated almost as servants. This painful situation grew more acute after Margaret’s recovery, for the relatives tried to regulate all her comings and goings. Not allowed to attend church as often as she pleased, the young girl was sometimes seen weeping and praying in a corner of the garden. It grieved her deeply that she could not ease things for her mother. Her eldest brother’s coming of age saved the day, for the property now reverted to him, and the family again had undisputed possession of their home. Philiberte had expressed a hope that Margaret would marry; the girl considered this, but at the age of twenty, inspired by a vision, she put aside all such thoughts and resolved to enter a convent. While awaiting admission, she tried to help and teach certain neglected children of the village. At twenty-two she made her profession at the convent of the Visitation at Paray-le-Monial. The nuns of the Order of the Visitation, founded in the early years of the seventeenth century by St. Francis de Sales, were famed for their humility and selflessness. As a novice Margaret excelled in these virtues. When she made her profession, the name of Mary was added and she was called Margaret Mary. She began a course of mortifications and penances which were to continue, with more or less intensity, as long as she lived. We are told that she was assigned to the infirmary and was not very skillful at her tasks. Some years passed quietly in the convent, and then Margaret Mary began to have experiences which seemed to be of supernatural origin. The first of these occurred on December 27, 1673, when she was kneeling at the grille in the chapel. She felt suffused by the Divine Presence, and heard the Lord inviting her to take the place which St. John had occupied at the Last Supper. The Lord told her that the love of His heart must spread and manifest itself to men, and He would reveal its graces through her. This was the beginning of a series of revelations covering a period of eighteen months. 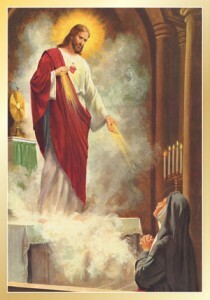 When Margaret Mary went to the Superior, Mother de Saumaise, with an account of these mystical experiences, claiming that she, an humble nun, had been chosen as the transmitter of a new devotion to the Sacred Heart, she was reprimanded for her presumption. Seriously overwrought, Margaret Mary suffered a collapse, and became very ill. The Mother Superior reflected that she might have erred in scorning the nun’s story and vowed that if her life were spared, she would take it as a sign that the visions and messages were truly from God. When Margaret Mary recovered, the Superior invited some theologians who happened to be in the town—they included a Jesuit and a Benedictine—to hear the story. These priests listened and judged the young nun to be a victim of delusions. Their examination had been a sheer torture to Margaret Mary. Later a Jesuit, Father Claude de la Columbiere, talked to her and was completely convinced of the genuineness of the revelations. He was to write of the nun and to inaugurate this devotion in England. For many years, Margaret Mary suffered from despair, from self-inflicted punishments, and also from the slights and contempt of those around her. In 1681, Father Claude returned to the convent and died there the following year. Margaret Mary was appointed assistant and novice-mistress by a new Mother Superior who was more sympathetic towards her. In 1683, opposition in the community ended after an account of Margaret Mary’s visions was read aloud in the refectory from the writings left by Father Claude, who had taken it upon himself to make known to the world the nun’s remarkable experiences. Mother Melin was elected Superior and named Margaret Mary her assistant. That she was finally vindicated was to her a matter of indifference. She later became Novice Mistress, saw the convent observe the feast of the Sacred Heart privately beginning in 1686, and two years later, a chapel was built at the Paray-le-Monial to honor the Sacred Heart; soon observation of the feast of the Sacred Heart spread to other Visitation convents. When she was forty-three, while serving a second term as assistant superior, Margaret Mary fell ill. 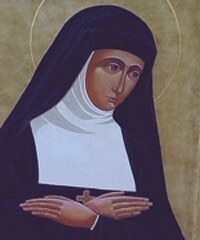 Sinking rapidly, she received the Last Sacraments, saying, “I need nothing but God, and to lose myself in the heart of Jesus.” Margaret Mary died at the Paray-le-Monial on October 17, 1690. Margaret Mary was canonized a saint in 1920. She, St. John Eudes, and Blessed Claude La Colombiere are called the “Saints of the Sacred Heart”; the devotion was officially recognized and approved by Pope Clement XIII in 1765, seventy-five years after her death. Her feast day is observed on October 16th. The devotion to the Sacred Heart first became popular in France, then spread to Poland and other countries, including, at a later period, the United States. The first petition to the Holy See for the institution of the feast was from Queen Mary, consort of James II of England. The month of June is appointed for this devotion, and since 1929 the feast has been one of the highest rank and is celebrated on the Friday after the Solemnity of the Body and Blood of Christ.